Charisse joined the Service-Learning program in the Fall of 2016. As an assistant to the Outreach Coordinator, she handles the daily office operations of processing student documents, answering students' questions about the program, creating annual fact sheets, and conducting orientations and workshops, as well as helping the other pathway leaders with on-campus events. Brian joined the Health Promotion Team in Fall 2017 as the Health Pathway Leader after completing service-learning as an AmeriCorps VISTA. As a Political Science and Economics double major, Brian is dedicated to comprehend health policy implications and increase civic engagement among younger generations. He hopes to positively impact as many individuals as possible in the public sector. Zea joined the team in Fall 2017 after completing service-learning with Mālama I Nā Ahupua`a in the spring. As a double-major in Pacific Island Studies and Environmental Studies, she is passionate about protecting our Mother Earth through hands-on service and policy according to indigenous cultural values. Kaloni joined the Education Promotion Team in Spring 2018 as the Education Pathway Leader after completing service-learning with Waikiki Elementary School’s food farm. As a Special Education and Elementary Education double major, Kaloni is striving to encourage the youth to experience the joy of making a difference. Akanesi joined the Arts, History and Culture Promotion Team in Spring 2018 as the Arts, History and Culture Pathway leader. As a Political Science major, Akanesi is committed to inspiring others with variety of knowledge that can be obtained through the exposure of the many arts, history and cultures. 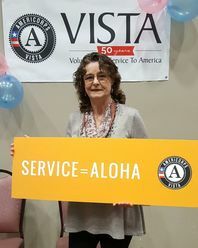 Denise has been working in the Service-Learning field since 1994 and held the position of State Network Director for Hawaii Pacific Islands Campus Compact (HIPICC) for 15 years prior to coming to KCC. Her passion is helping students become successful in pursuing their educational goals. As the Faculty Outreach Coordinator, Krista facilitates the connections between faculty, and Service-Learners and community partners. She has organized events such as Service-Learning Faculty Field Trips, Sustainability Institutes, and Faculty Institutes. Krista also is a main contributor during assessments. Her passion for sustainability, service, and education is the perfect ingredient for our program. The academic programs at Kapi’olani Community College prepare students to meet rigorous baccalaureate and career standards in the future. Service-Learning emphasizes that students need to be engaged as productive citizens now and into the future. This context of immediacy and relevance helps service-learning students better understand key course concepts, clarify degree and career goals, and develop the problem-solving and teamwork skills they need in Hawaii’s diverse communities, now and into the future. The problems we all confront—poverty and homelessness, ethnic health disparities, emerging infectious diseases, under-resourced public schools, long-term care, ecological degradation, and climate change—need the focused intellectual and social capital of all of us. Service-Learning helps ameliorate all these problems beginning now.